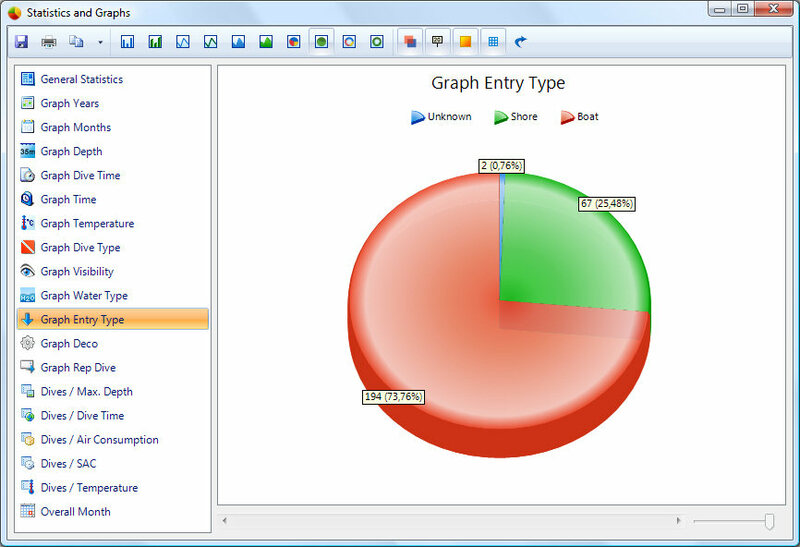 The statistics window of version 5.0 is almost complete and I want to show you the changes and improvements. Beside some visual refreshments the “General” and “Additional” text statistics has been merged and moved to the top of the list. Some of the text items from the “Additional” panel were removed, because this data is already available as visual chart display, so it would be duplicate data (e.g. the depth range). 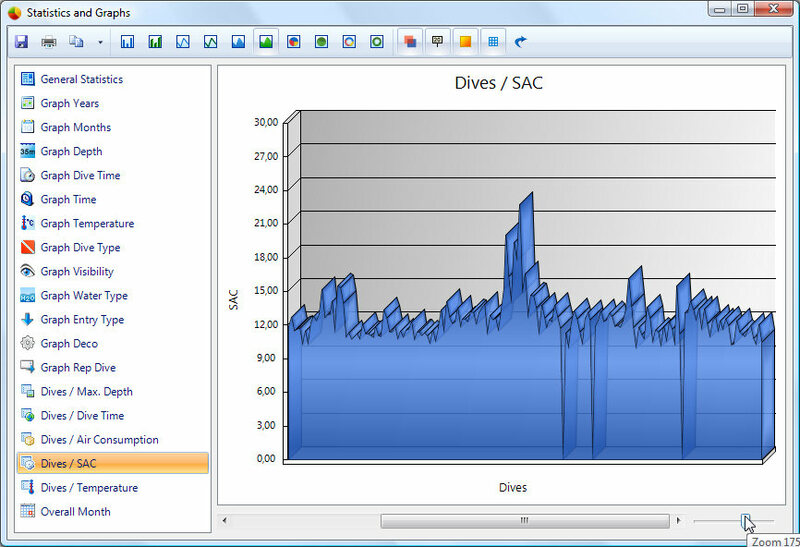 The water- and entry type as long with the deco and repetive dive statistics will now be displayed as separate charts. 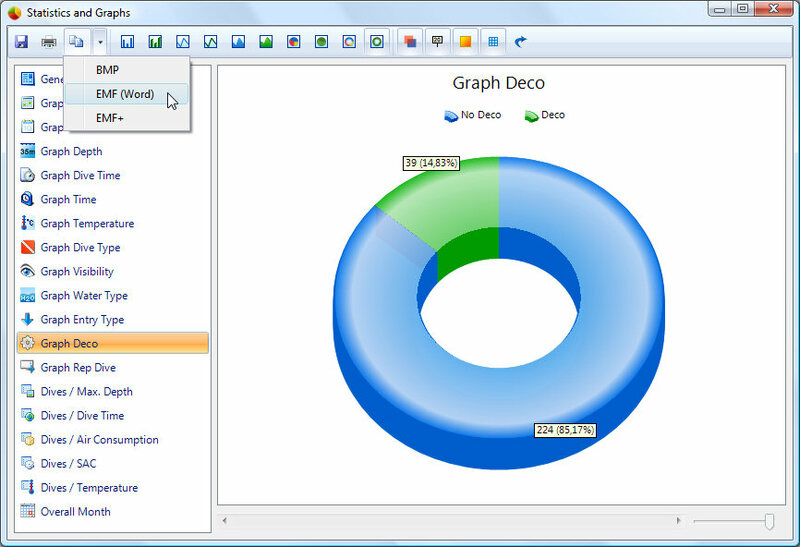 To display this kind of data I’ve added 4 new chart types: Pie, Pie 3D, Donut and Donut 3D. As you can see in the 2nd screenshot, the copy button has now a drop down menu where you can select the graphic format. The EMF format is best suited for pasting into Microsoft Word, because it is a vector format. The “save as file” function can now save the chart image as JPG, PNG, BMP and EMF. The scrollable charts can now be zoomed to the full logbook range. If you have 1000 dives in your logbook you can zoom out until you see all dives. If more than 50 dives were displayed, the chart will automatically switch to either a line or an area chart type, because displaying more than 50 bar chart entries would cause bad performance. For the same reason the x-axis and the vertical grid lines will be hidden with more than 50 dives displayed. 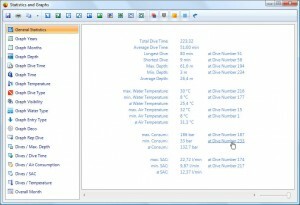 This entry was posted on Tuesday, April 7th, 2009 at 6:04 pm and is filed under Diving Log 5.0. You can follow any responses to this entry through the RSS 2.0 feed. Both comments and pings are currently closed. With DL4 if you did a dive with buddy A and an other dive with buddies A + B and you use statistics/buddies, about buddy A you’ll get only 1 dive, would it be possible to get 2 dives in DL5. In DL4 if you select more then 1 buddy it creates a “composed buddy with all names” maybe a group function can be an idea ? I saw nice screen-shots of DL5 and maybe Hierarchical Browser will resolve this ? Greate job, thanks a lot !!! Any idea of when DL5 will be available ? 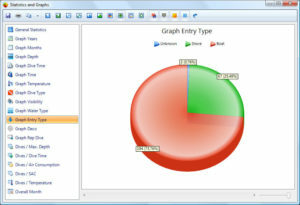 In Diving Log 4.0 you must enter the comma seperator (comma and one space) in the preferences dialog to split the buddies in the statistics. 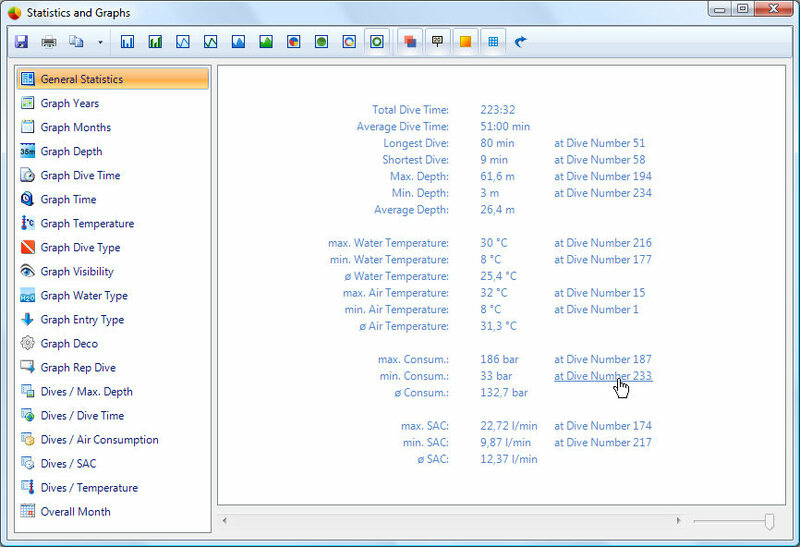 In Diving Log 5.0 this will be done automatically, but this works also in 4.0 already. I’m sorry, I don’t currently know when I have a first alpha version ready. Thanks ! It works perfectly !